Disasters, and calamities are nothing new in the Philippines. Storm, typhoon, volcanic eruption, and earthquake are only some of the natural calamities that usually occurs in the Philippines. Sometimes even the most prepared of all has no match when natural disaster strikes. Those who have homes can end up homeless. The farmers end up with devastated crops. And even cities end up severely destroyed, no electricity, and sometimes no water. 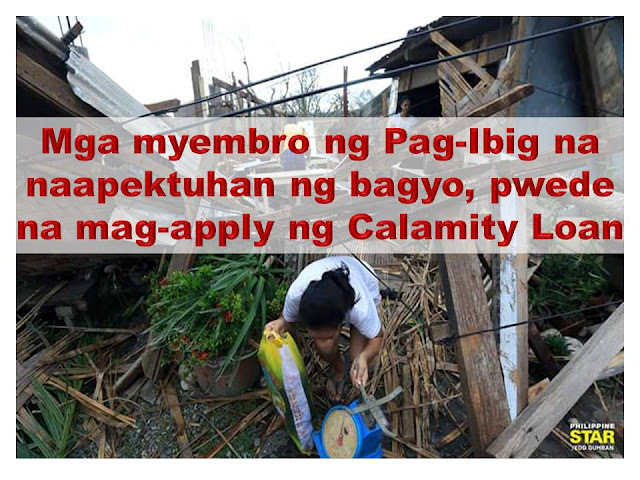 For those who are victim of natural disasters, the government offers Calamity Loan through Pag-Ibig.Victims of calamities and natural disaster can apply for this type of loan within 90 days from the declaration of calamity. Who Can Avail/ Apply For Calamity Loan? 1.Active Pag-Ibig member who has made at least 24 months contribution. 2. If with existing Pag-IBIG Housing Loan and/or Multi-Purpose Loan (MPL) and/or Calamity Loan, the account must not be in default as of date of application. 2. Accomplish 1 copy of t he application form. 3. Attac h photocopy of payroll accounUdisbursement card/deposit slip (for newly-opened account). 4. Sub rnit complete application. together with the required documents to any Pag-IBIG Fund NCR/Regional branch. Processing of loans shall commence only upon submission of complete documents. d) Other similar modes of payment.